MILWAUKIE, Ore. -- The head of the Oregon Liquor Control Commission has resigned after a weekend drunken-driving arrest. 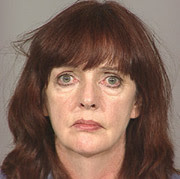 Teresa Kaiser (pictured) was arrested Saturday night near the Ross Island Bridge. As you may know, I am off for the next two weeks on family medical leave and want to tell you about a very personal matter. Due to circumstances that I deeply regret, I am resigning as the Executive Director of the Commission. I'll return on May 15, 2006 to tie up some loose ends and will say my goodbyes at that time. Although my departure is abrupt, I am confident that the extraordinary work of the outstanding employees of the Commission will move forward. You are some of the finest people I have ever worked with. I know you will continue to soar long after I have moved on. An emergency meeting is planned for Friday to appoint an interim director. Kaiser has held the position since 2003. She graduated from Portland's Lewis and Clark Law School and worked as an attorney for seven years as well as in liquor enforcement in Colorado and Washington.